Arroyo Bridge Books, 9780984784660, 356pp. 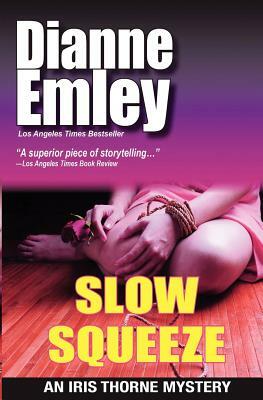 Slow Squeeze is the second in the critically acclaimed Iris Thorne mystery series by Los Angeles Times bestseller Dianne Emley, now available as a trade paperback. Includes bonus material: the first chapter of Fast Friends, the third in the Iris Thorne series. Iris Thorne survived the purge following McKinney Alitzer's chain of scandals. The murders, money-laundering, and million-dollar embezzlement were front-page dirt-and rumor has it that Iris knows where the bucks are buried. Now she's the firm's highest-paid and most senior investment counselor. But happiness is a rare commodity in Iris's private life-she and her LAPD lover are approaching a dead end. Dianne Emley is a Los Angeles Times bestselling author and has received critical acclaim for her books which include the Detective Nan Vining thrillers: The First Cut, Cut to the Quick, The Deepest Cut, and Love Kills and the Iris Thorne mysteries: Cold Call, Slow Squeeze, Fast Friends, Foolproof and Pushover. Her books have been translated into six languages. A Los Angeles native, she lives in California with her husband Charlie.